A stamp is a tiny, flimsy thing, no thicker than a beetle's wing. And yet it will roam the world for you, exactly where you tell it to. some pundits state that with the advent of email and the internet letters will be come a thing of the past and we may even see a disappearance of mail delivery. it is true, I am guilty of not writing letters like I used to, but it would be a tragedy if we abandoned the practice of writing and posting personal mail. my recent visit to the national postal museum rekindled my resolution to write and send more cards and letters; it is time to start working on that stack of postcards that is sitting on the edge of my desk, each waiting for a scribble and a stamp so it go exactly where I tell it to. it is amusing and ironic that the mascot of the post office is a dog. 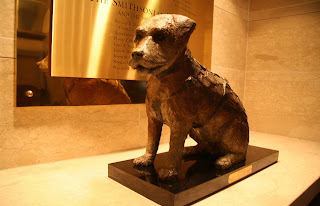 the story of owney the mail dog is quite compelling. owney was a stray mutt who wandered into the albany, new york post office in 1888. the clerks were smitten with owney and let him hang around. there was something about mail bags that he found intoxicating and he had a practice of following bags on their journey. he would ride with the bags on trains as they traveled the state and then the country. in 1895 owney made a trip around the world traveling with mailbags on trains and steamships to asia and across europe, before returning to albany. In 1897, the Railway Mail Service decided Owney was getting too old to travel. He had lost sight in one eye and reportedly could eat only soft foods and milk. For his protection, Owney was sent into retirement at the Albany post office. Apparently, he did not like the idea of being permanently grounded in Albany. In June 1897, he slipped out and boarded a mail train for Toledo, Ohio, where tragedy struck. Owney was mistreated while being shown off to a newspaper reporter in Ohio and became so mad that he bit a postal worker. Although the exact circumstances were never satisfactorily reported, Owney died in Toledo on July 11, 1897, from a gunshot wound. my flickr set the postal museum is now up. one of the displays in the a-z exhibit at the postal museum focused on mail art. of course, I immediately thought of our good blogging bud coffee messiah who has posted much on mail art, one post can be found here. coffee is also very talented when it comes to the creation of mail art and quite an inspiration to the repressed mail artist that resides in all of us! I'm glad you had a good visit with your parents. I would love to check out that museum. 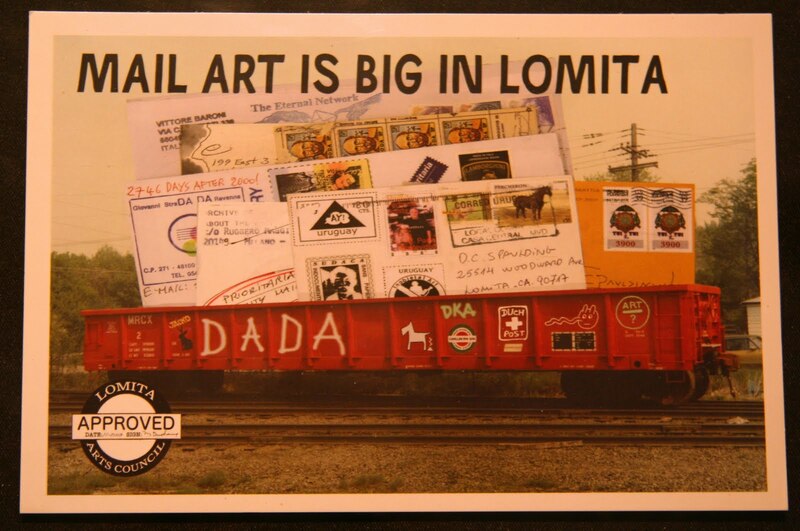 Have you seen Coffee Messiah's posts on mail art? There is nothing more satisfying than receiving a letter or card with the sender's actual handwriting. Sounds like you you learned a few things. I'd really like to start figuring out mail art, but I fear I'd never think up the kinds of things Coffee M. does! monsieur coffee came immediately to mind when i was enjoying the small mail art display. I should have added a link to his recent enjoyable post on mail art. in fact, I will do that now! thanks e and tut! I've discussed the death of the hand-written (or typed) snailmail letter on various occasions and it's sad: I used to write and receive lots of letters. But I've lost the habit and use email like everyone else. Except I hang on to the postcard. On holiday, I love sitting in a café or pub and writing postcards (including always one to myself). And I have kept all the postcards I've been sent over the years. On one single bit of cardboard there is a story, a picture and a foreign stamp, a date and some words from a friend. Perfect. Very interesting. I've just come from another blog lamenting the loss of the political postcard in the early 20th Century. You're right about email taking over from normal mail but I think I'll still be sending Christmas cards this year even if my writing is almost illegible! Hey Thanks.......BTW, both Barone (T) and Spaulding (Bottom) are big names and have been around quite awhile sending MA. I need a raise so I can send more. ps: ooops, wanted to mention, a cousin and I made our own envelopes and sent things like this to each other for years, through jr high and hs. I never knew then that it was a movement. I rarely purchase a card/envelope anymore and anyone can do it, no strings attached or anyone passing judgment on what you send. There is an antique book store around the corner from where I live, where he sells USED postcards from decades long gone. It's fascinating to see the stamps, the penmanship, and the feeling expressed. Truly, a lost art. Funnily enough, blogging/email have not made a dent in my snail mail habits. They've just given me more people to send cards/letters to! still send out doodled cards, etc, but not many letters..alas. Is it just me, or is the graffiti on boxcars cool? I have to admit that I send more emails than snail mail letters. But I try to put the same literary effort into my emails (at least the longer ones that aren't just for informational purposes). As for mail art, I used to email out things called "Roy-Cards" which featured photos, digital art, and often digital collage art. Hmmm... Maybe I should revive them. Ownet sure got around, didn't he? We seem to share the same thoughts Kimy. I am with you all the way with the resolution about using the post. I miss the artistic aspects of paper mail, though, and the handwriting. It definitely has a more personal touch. And, my mom lives in Lomita! dd - I try to do the same thing on holiday, but inevitably I'll get distracted in the cafe or pub I pop into to write my postcards and come home usually with 80% of the postcards I buy purchased with a specific person in mind! baino - yes, alan's most interesting post on postcards! looks like a theme! I've notice my handwriting has gotten quite dreadful now that I keyboard more than I write by hand. have fun with the holiday letters! coffee - I hope you get that raise!! thanks for beautifying and stimulating the mail!! bee - you are among a very special minority I bet in that regard. I think many of us have found that we send much less snail mail than we used to....although I do try and send postcards on occasion to those in the bloggyhood whose addresses I have. tom - it's not just you - I love box car graffiti! I also have a weakness for a lot of (well done) graffiti - although a couple months ago when I noticed someone wrote on the mermaid statue in the cleveland museum of art's sculpture garden I did get irrate - that type of thing gives street art a bad name! roy- I hope you roy art returns! yeah, that owney - and I still can't get over that he eventually bit a mail worker which then lead to his demise. maybe it was a case of suicide by cop. afterall, he couldn't travel any more! what was to live for. alan - I heard some twilight zone music! steve - in addition to stamps, there is something special about holding a letter or a card in hand and being able to quietly contemplate it and the sender. musicjunkie - that is wild that your mom lives in lomita, you have to ask her about mail art! hard to comment--word veri makes me try and try again.